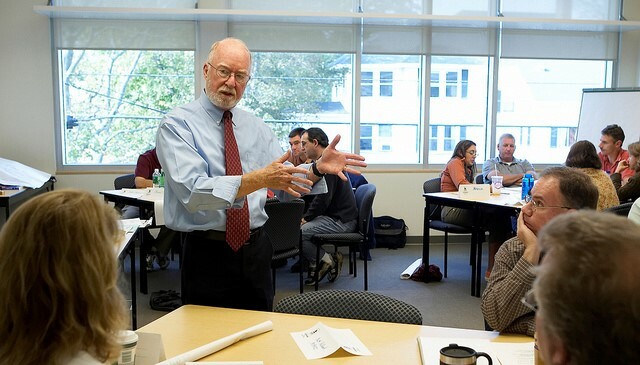 Jim Milliken's Effective Project Management workshop series is scheduled for next month at USM and at UMaine's Hutchinson Center. At USM's Abromson Community Center in Portland, the three-day program will run from 8:30 a.m. to 4:30 p.m. on Wednesdays March 13, 20 and 27. At the University of Maine Hutchinson Center in Belfast, the dates are Thursdays March 21 and 28, and April 4 from 8:30 a.m. to 4:30 p.m. The course is designed for managers and professionals who work in group activities to innovate change and create solutions. Participants typically have been managing such work for some time without formal preparation, and are interested in improving their skills and reducing time and effort. Effective Project Management is rich in "Aha!" moments for them they learn common-sense ways to set up and organize complex innovations. USM also has scheduled the three-day follow-on course, Implementing Project Management. This second design builds on the basic Project Management design, examining actual projects, identifying problems/solutions, developing plans and practicing skills project managers need on the job. Those dates are Tuesdays April 9, 16 and 23. Life is a project. Sound interesting? That's Jim's new book. It applies his experiences and ideas to ways we can live more productive and satisfactory lives without a lot of hassle. It shows how personal these ideas can be. If you like what you read in Jim's blog posts, then you will enjoy this book. 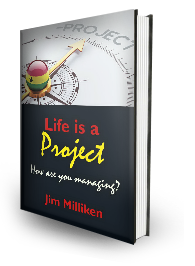 Learn more about "Life is a Project" on Jim's blog site. Jim's book is available below using the "Buy Now" button, or you can order directly through Jim with the info below the "Buy Now" button. To order directly from Jim Milliken: Life Is a Project, 21 Everett Avenue, South Portland, Maine 04106. Enclose your check for $24.05 USD (Life Is a Project $19.95, shipping & handling $3.00, Maine sales tax $1.10). Jim Milliken is a consultant and coach who invests decades of in-the-grind experience in helping individuals and organizations become more productive and communicate more effectively. He works on-site with executives and managers to improve the processes and structures of organizations. In companion consultation, Jim provides customized skill-building counseling in the key skills of management and professional performance. Jim also presents classroom training, with workplace-based designs that emphasize practical skills in Project Management, Communication and Personal Productivity. And he is an interviewer and writer known for producing insightful reports and profiles; he provides professional editing services for newsletters and for writers of magazine articles and books; and he coaches writers in a broad range of disciplines. For professionals in midcareer, he provides counseling in workplace advancement and job interviewing/resume skills. As an accomplished public speaker, Jim Milliken provides presentations in any of his areas of specialty, customized for specific technical, managerial and professional requirements. Jim is active in the Association for Consulting Expertise; the Maine Chapter, Project Management Institute; and the Corporate Partners of the University of Southern Maine.